Blueberry muffin fruit tea - Monsieur T.
A necessity when you have your friends from Lac-Saint-Jean over or simply remembering your mom's. Jams, jellies, pies, muffins. Blueberry is a delicious little fruit that you never get tired of. You'll love this fruit tea that captures the essence and flavor of hot blueberry muffins. This colorful combination contains apple pieces, hibiscus, rosehip bark, caramel, yogurt, blueberry pieces and mallow flowers. What a delight! 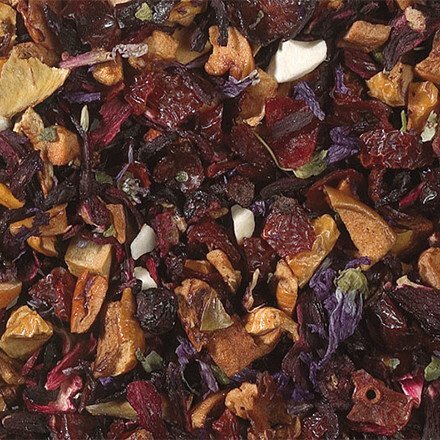 Contains: Apple pieces and hibiscus, rosehip bark, caramel pieces, flavors, yogurt and dried blueberries, blue flowers of mauve.